Karen Terlecky brings lessons from her adult book club to her structure of book clubs in her 5th grade classroom. The article includes launching and management tips. Katie DiCesare comforts a student in tears at the end of the day, and realizes part of the problem may be that she moved the child into a guided writing group too quickly. Shari Frost questioned the amount of writing going on in many elementary writing centers. She decided to work with a team of literacy coaches and teachers to explore ways to increase writing in classrooms – through better use of centers, or alternative programs. In this follow-up article, Shari presents two different solutions that are working well – one involves introducing writing tools in a more systematic way in centers, and the other is an implementation of a different program entirely for independent work. 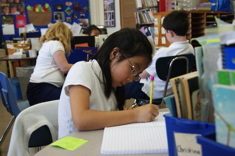 In the last installment of this three-part series, Katie DiCesare shows how she translates the findings from individual students into instructional plans when she uses a spelling assessment in her 1st grade classroom. In this video from a fifth-grade small group, Clare Landrigan talks with students about making predictions and finding evidence in text. Shari Frost shares the nuts and bolts of setting up open book clubs in your school. These clubs are a great way to expand the reading community, as well as connect school libraries and classrooms. Kathy Collins gives a detailed definition of how reading centers are connected to the goals of different reading units of study. 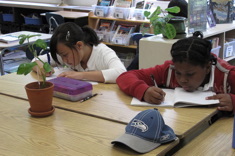 Shari Frost finds writing centers are beloved by many teachers and students. There’s only one problem – very little writing appears to be going on in the centers. 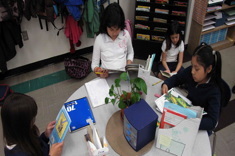 In this small group after a demonstration lesson in a 5th grade classroom, Clare Landrigan talks through strategies for inferring the meaning of new words while reading. Clare Landrigan meets with a group of fifth graders to talk about what’s going well in literacy workshops, and to set individual goals. In this video, Aimee Buckner uses a mentor text to demonstrate how writers construct lively nonfiction paragraphs. Katie Doherty’s 6th grade students discuss the read-aloud through partner shares. 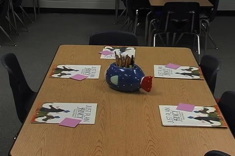 In this second video of a three-part series showing a teaching progression for the Rule of 3, Aimee Buckner has asked students who might want a little more information or help after the whole-class lesson to stay for a small group. In this example of reading instruction with a small group, Gail Boushey of “The Sisters” leads a discussion of inference, using Peter Rabbit as a focus text. All of the children in the group are reading at different levels independently, but they share a goal of learning more about inferring.